Online registration for this event is closed. You can still sign up on Thursday at the event site starting at 4:30 PM and ending at 6:30 PM! Registration fee is $35.00. 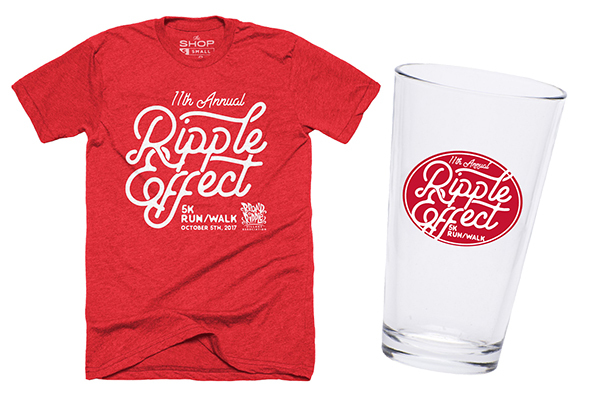 Join hundreds of runners and walkers on Thursday, October 5th (6:30pm) for the Ripple Effect 5k, presented by Sharpen! Now in its 11th year, the Ripple Effect 5k has become a tradition for runners and walkers in the Indianapolis-area! 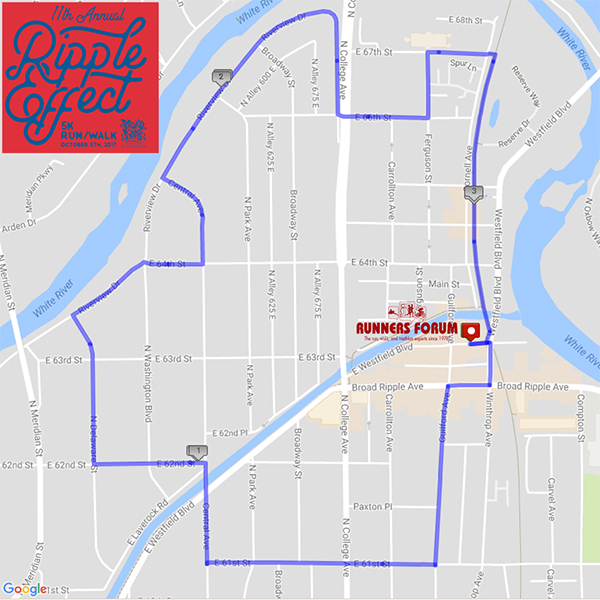 Participants will start and finish at The Runners Forum, and will get a scenic tour of the sights and sounds around the village of Broad Ripple! Be sure to stick around once you finish for the post-race block party, complete with vendors, refreshments and music! To make things even sweeter, all participants over 21 will receive 2 FREE beer tickets to redeem after you finish! - 16oz. Pint Glass to the first 300 registrants! - Food and drink provided by Greek's Sobro and Taproom and Yats! Stick around after you finish for some post-race celebrating! We will have a variety of vendors present, raffling off prizes and other giveaways. All participants, over the age of 21, are invited to grab 2 FREE beers from our beer vendor in the lot behind Runners Forum! Not a beer drinker? No problem! We'll have lots of other refreshments to help you re-hydrate. And NEW for 2017, we'll have food provided by Greek's Sobro and Taproom and Yats! The event will start and finish near the Runners Forum in Broad Ripple, at Guilford Avenue and Westfield Boulevard. Parking is available in the surrounding neighborhood. Please note that no vehicles will be allowed to park on Westfield Boulevard, between Guilford Ave. and Winthrop Ave. during the event. Please note that shirts are not guaranteed to those that register after September 22. When this page loaded, the official time was 4:11:37 AM EDT.